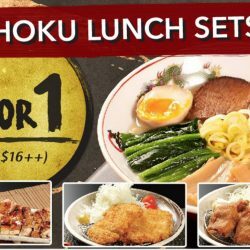 Exclusive for J Passport members, enjoy exclusive 1-for-1 Teishoku Lunch Sets at all 4 Kotobuki Izakaya outlets! Kotobuki Izakaya is one of the oldest Japanese dining establishments in Singapore with 32 years of serving authentic Japanese cuisine! Redeem this deal at J Passport app by 31 August 2016. If you are not a J Passport member, all you need to do is to download the Jpassport app and sign up for their member at no charge. Jpassport recommends dining deals from many Japanese restaurants, it's a must for lovers of Japanese food!